Have You Eaten Grandma? is a book I just couldn’t resist as I am fascinated by language, definitions, etymology and evolution. Gyles Brandreth is well known for his eloquence and ability to speak on any subject at great length, so is the ideal person to have written this book about the correct use of English. He is passionate about English and very keen that correct English is used but not such a traditionalist that he is not also excited about new words. He points out that “to speak good English, you don’t have to sound like the Queen. Good English isn’t about your accent: it’s about your ability to communicate – clearly, effectively and (when you want to) passionately.” Importantly, the author recognises that some people, for example those who suffer from dyslexia, do have difficulties with written language which can lead them rather unfairly to be labelled as ignorant or ill-educated. The book is full of funny asides where I could almost hear and picture Gyles Brandreth with a wry smile on his face. As you might expect, the book, although quite technical at times, is very witty. It made me smile to hear how he did battle with his publishers over spelling and spacing of certain words and phrases. I do feel that this book would benefit from being read as a physical book rather than on an e-reader. I found that it could sometimes be a bit challenging to follow, especially where footnotes were concerned as, of course, my Kindle is not laid out quite like the page of a book. I should say though that my copy was a review copy and it is entirely possible that these issues are not a problem on the finished e-copy. I am going to check this review very carefully for spelling or grammatical errors. As the author says, I don’t always get it right but I always try to! The most important message from this book is that clear communication is essential. 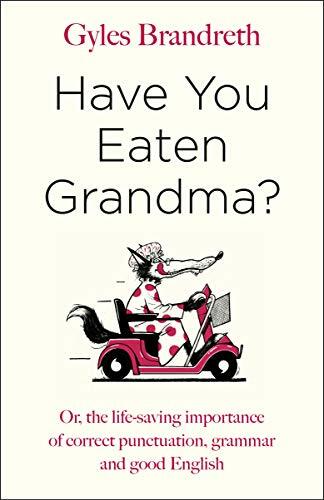 “The more effectively you can communicate, the more successful you will be in every area of your life.” Have You Eaten Grandma? is informative and entertaining, and would make an ideal Christmas gift for anyone who is interested in language. My thanks to the publishers Michael Joseph Books for my copy of this book from Netgalley. It is available now in hardback from all good book retailers or you can order a copy online here: Have You Eaten Grandma? Why, like, does everyone keep saying ‘like’? Why do apostrophe’s keep turning up in the wrong place? Why do we get confused when using foreign phrases – and vice versa? Is it ‘may be’ or ‘maybe’? Should it be ‘past’ or ‘passed’? Is it ‘referenda’ or ‘referendums’? FFS, what’s happening to our language!? Our language is changing, literacy levels are dwindling and our grasp of grammar is at crisis point, so you wouldn’t be alone in thinking WTF! But do not despair, Have You Eaten Grandma? is here: Gyles Brandreth’s definitive (and hilarious) guide to punctuation, spelling, and good English for the twenty-first century. Without hesitation or repetition (and just a touch of deviation) Gyles, the Just A Minute regular and self-confessed grammar guru, skewers the linguistic horrors of our time, tells us where we’ve been going wrong (and why), and reveals his tips and tricks to ensure that, in future, we make fewer (rather than ‘less’) mistakes. End of. 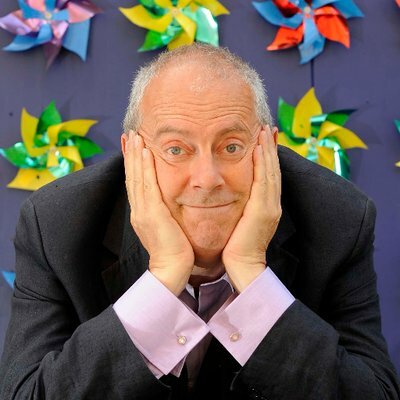 Gyles Brandreth is an English theatre producer, actor, politician, journalist, author and TV presenter. Born in Germany, he moved to London at the age of three and, after his education at New College, Oxford, he began his career in television. He went from presenting Puzzle Party in the 1970s, to appearing in Countdown‘s Dictionary Corner for over 300 episodes. His career has since encompassed becoming an MP and appearing regularly on TV and radio, but writing is his true passion. His past books include; Word Play, Oxford Dictionary of Humorous Quotations and Breaking the Code: Westminster Diaries. Thank you. I subscribed to the podcast. It sounds very much like my kind of thing. Brilliant sounding book that I have added to my wish list. I must get this book@ As an editor and manuscript assessor, I spend a lot of time correcting grammar — and I often use the title of this book as a example! Just my cup of tea.